On weekends I love pulling in a 160kbps ogg stream from Virgin Radio in the UK. It sounds great until about midnight, PST, sunday - then I have to go back to american stations. there's a lot to like about ipv6 - once enabled, applications that use it just work, aside from putting a sniffer on the case, you'd never know there was a different protocol running. The problem with ipv6 is at the edge of the network. Sure you can use a tunnel broker - but the real answer is for the comcasts and sbcs of the world is for them to start offering up ipv6 addresses in addition to the standard ipv4 address. Enough of ipv6 just works automatically that most users would never notice. I also upgraded my network today to one of those new longer range a/b/g wireless access points and for the first time I've been able to get rid of my extended range antennas and still make it down to the outside office (where my synth is). I had to pull out the broadcom mini-pci wireless card and go to a current pcmcia card as well - but at least I'm online - and outside - on a beautiful day. Until that fateful day that I finally get my rme sound card; then I have a choice between making music and being online. I picked up an atheros chipset wireless card as well, but lspci isn't seeing it. I'll hack on that in a little bit. It's just nice to have all my hardware working that I intend to have working - taht.net is down, but I'm going to Xen that whenever I get around to it - in the interim it's nice not to have to sort spam out of my mailboxes every day. I've come to understand that the source of my discomfort with this office is the gringo door - having my back to the door is disconcerting - but the room is too small not to have the door back there. Maybe a mirror? 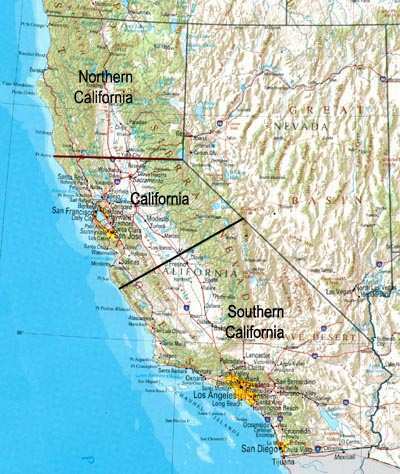 Split California into 3 states - si! California needs to be split into three states. The state was only to be allowed to be as big as it was because it was sparsely populated. With an economy that would be 7th in the world if California was a stand alone country it’s ridiculous that its large mass and huge population is represented by only two US Senators, neither of whom represent the interests of the state as a whole. The State is also ungovernable as a State of this size with such a large population. It’s more of a country than a State by any measure – and a poorly run one, at that. California would also do better if it split itself off from the Union entirely - Imagine what our space program would be like if JPL got all the money - if our taxes didn't flow back to washington before being spread around the US in useless LBJ-derived largess! I admit it. I'm a rocket junkie. I just spent a half day mooning over rocket ships. Also spent some time reading over a blog from the JPL center. The "Whipple Shield". Heh. The coverage keeps getting better. I always wanted to live on a comet, or asteroid. Sure, I may write a lot about the commercial value of mining NEOs, and complain a lot about the costs of manned exploration, but it's only because we need robotic missions to pave the way for humans in space. I long ago gave up any hope for me actually getting to space - I'm overweight, underqualified, and just generally a bad choice - but I do ferverently hope that some day, before I die, mankind will have moved into the solar system in a big way. "Right now we're minus one spacecraft," said Rick Grammier, Deep Impackt project manager at JPL. "It's been totally vaporized... as planned." To find out more all we have to do is exert the same amount of force as over 6700 horses could exert over the course of an hour. Of course, the ultimate collision didn't quite live up to artistic expectations, but it did turn out that Tempel 1 was a great deal more firm than previously believed. 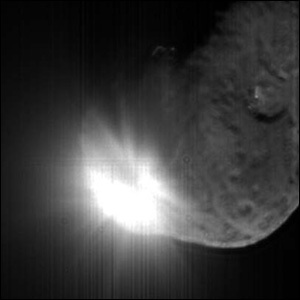 If it weren't for their long periods, comets may turn out to be a great place for men to live. anti-ballistic missile applications? Of course it does. Clementine-2 - the first designed impactor mission - was canceled in '93 because of it's association with SDI. The problem is: hitting objects at long distances is a useful skill to have - whether you're a baseball player, or a nation worried about national defense, or a frustrated engineer that wants to know - quickly and cheaply - just what M and S class asteroids are made of. Still my favorite twinned body is Toutatis, shown here, passing by only a few lunar distances away last september.